As a notary public appointed by your state, you will often run in to a heavily-worded and crowded documents where there is almost no room allotted for you to notarize. With that in mind, we have created the 100% American-made Official Rectangular Notary Rubber stamp. Made of handcrafted wood, our talented staff assembles your custom Official Rectangular Notary Rubber stamp in-house. The Official Rectangular Notary Rubber stamp requires the use of an additional ink pad and can be used indefinitely as long as your ink pad is not dried out. This is a basic, economical stamp that is guaranteed to get all your notary public duties done efficiently. Unsure if this stamp is permissible in your state? Contact us! The Official Rectangular Notary Rubber stamp will not only fit in your budget, but can also comfortably fit in your pocket or desk drawer. With the addition of a separate ink pad, the Official Rectangular Notary Rubber stamp is work horse. Made of materials that are 100% made in the US, the Official Rectangular Notary Rubber stamp is extremely durable and can easily fit within margins of overcrowded documents. 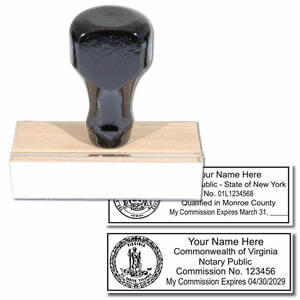 The Official Rectangular Notary Rubber stamp comes complete with your state's seal if permitted. Our experienced team hand makes each custom Official Rectangular Notary Rubber stamp and assures that every state board requirement is met.